Home AF Cares Join Us To Help Save The Elephants Of Thailand! 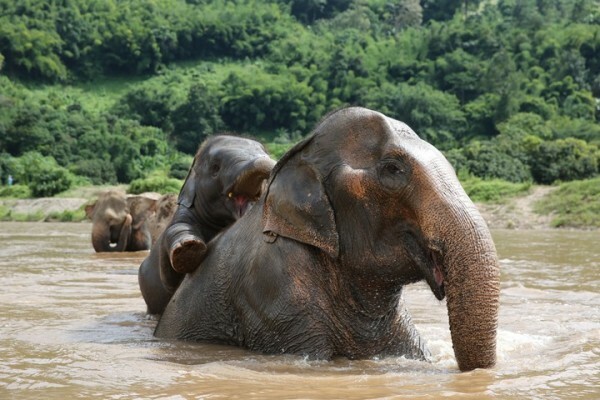 Join Us To Help Save The Elephants Of Thailand! A bond that won’t be forgotten. In Northern Thailand, a beautiful movement is growing. 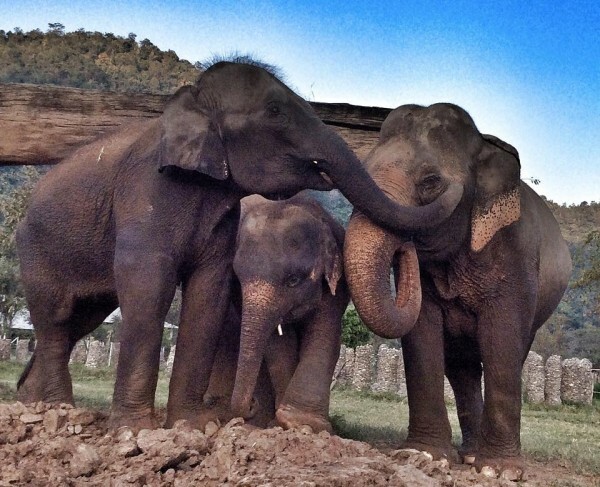 Since the 1990’s, Elephant Nature Park has been providing a sanctuary to elephants rescued from street begging, logging, and various tourism based activities. And it’s about time someone did it! Elephants have been on the decline over the past decades; there are only about 500,000 African elephants left, while lower then 30,000 Asian elephants are still in existence! That’s a little bit of a problem, wouldn’t you say? Since Lek Chailert, the park’s fearless leader, began the organization in 1996, things certainly haven’t easy. 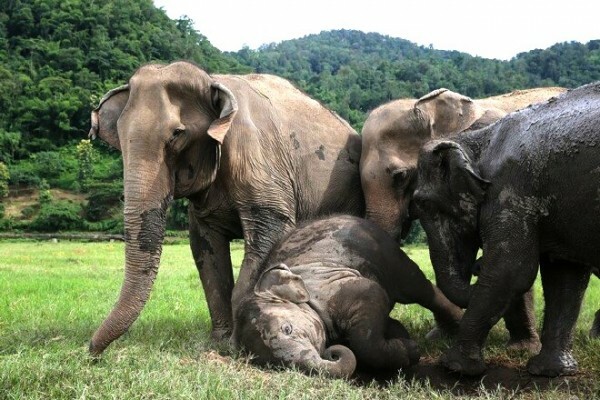 The park, as well as Lek and the Mahouts (elephants riders) who help her, have been attacked and threatened by none other than the Thai government. And the reason the government was attacking her? Because the illegal elephant trade and harsh treatment are relatively common across Thailand, and the people don’t want that to change. Lek didn’t let that stop her, though, and she continued to stand up against the government and the common belief of society, because she knew they were wrong. At her refusal to back down, the government continued to target both ENP and the Wild Life Friends Foundation of Thailand, another organization that was brave enough to speak out against the illegal elephant trade. Despite threats that Lek would be arrested, the elephants confiscated, and the volunteers harassed, the Elephant Nature Park has refused to step down from its role as an elephant sanctuary. They knew that what they were standing for was much stronger than anything the government could bring against them. “I can’t turn my back on them,” explains Lek. “I can look in their eyes and see fear. Somebody has to stand up for them.” And luckily, Lek is willing to do it… with an army backing her that spans around the world. Lek shows an educational video to the Mahouts, which the elephants enjoy watching as well. It turns out that they were right. Since the creation of the park, it’s influence has grown beyond what Lek had ever imagined. The park is now called home by more than 30 elephants of all ages, including many who are disabled, blind, and orphaned. Three baby elephants have been born in the park within a few months of their opening. Everyone involved can see that this park is well on its way to making a difference. It helps that the park involves people from all over the world. People travel from from far and wide to interact with the gentle giants, and witness them in a more natural environment. Volunteers can pay to go and stay at the park for different periods of time varying from a few hours to eight weeks, depending on the experience you’re looking to have. 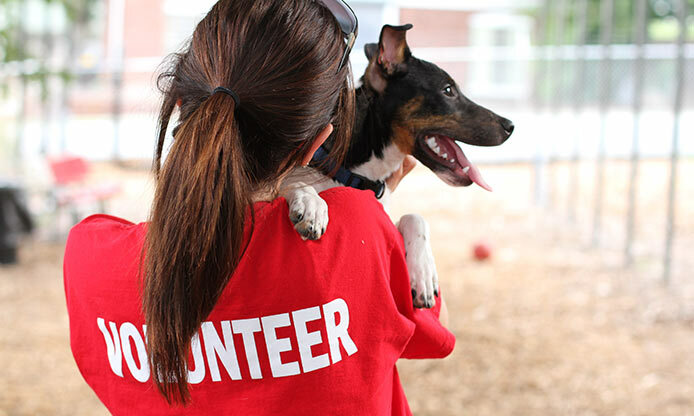 As a volunteer, you help feed, bathe, and maintenance, as well as veterinary work. Additionally, Lek began rescuing dogs during the horrific flooding that occurred in Bangkok in 2011; resulting in 155 much smaller, furry additions to the park’s wildlife that you can work with. But the visitor experience isn’t all about helping the animals that are in their care. 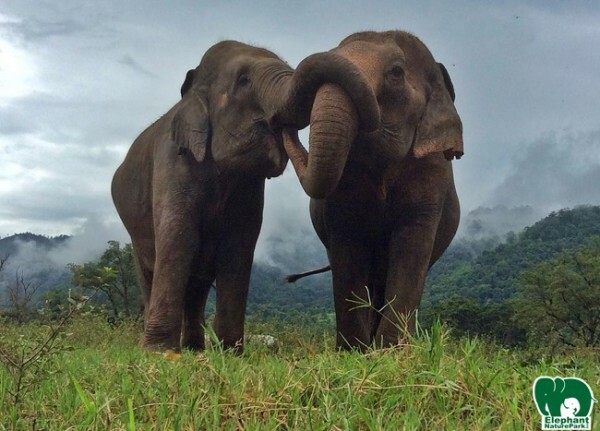 The bigger goal is to make a difference for animals worldwide; “In the park, we focus on education and telling the situation of the Thai elephant. We want people to see elephants in the nature and respect them,” Lek said. “We try to send our message around the world. And also, we hope and expect that when people leave the park, they go out and educate more people. 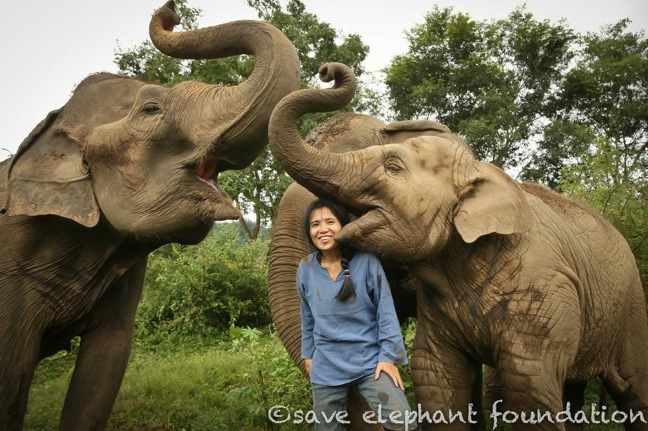 We want to build a network.” And this network is growing as more and more people discover Lek and her wonderful haven for elephants. Wendy traveled out to Thailand to help out with the elephants! 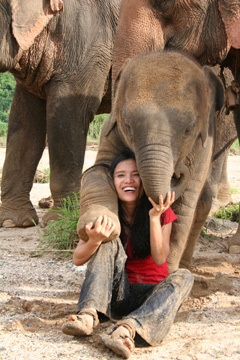 Lek Chailert has made a difference in animal conservation in many ways other than just providing a home to the lost elephants and dogs who live at the park. Two projects were particularly successful; the Jumbo Express and Elephant Haven. The Jumbo Express provides emergency medical treatment to elephants in areas that are more remote. In doing so, it builds ties with the rural communities in which it is needed. This acts as a sort of EMS for the elephants. The other successful project is that called ‘Elephant Haven’, which gives the elephant a place to get away from society and relax in their natural environment. Taking all of this into account, it’s no surprise that Time magazine named Lek Chailert as ‘Asian Hero of the Year’ in 2005. She certainly deserves it. The woman created and still manages to run a wildlife park that gives new life to hundreds of homeless animals in need. She even organizes educational talks for her volunteers and visitors to raise awareness about issues that elephants and other endangered animals face worldwide. These animals are worth saving for them, and apparently, for mankind as well. Want to help? Click here and check out their website! There you can learn about volunteering, donating, and spreading awareness about the plight of the elephants! These gentle giants need our help, so spread the word! As Lek has shown us, all it takes is one person to change lives. So what are you waiting for? Get involved now! 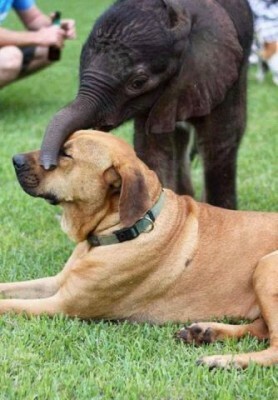 I can assure you those elephants won’t forget it! See here what it’s like to go to Thailand and experience the animals in their natural environment! Wendy traveled on a volunteer vacation to the Elephant Nature Park, and here she is, bringing you an inside look on all things trumpet-worthy! Previous articleHow to Make Pup-sicles For Hot Dogs!